8bit computing is now living a second youth: not only the guys who were there when it all started (I was!) but also a wild bunch of new enthusiasts, are now craving to work on those old-times beauties. 8bit computers are now very easy to emulate with cycle-exacts features on today’s powerful computers. Even though you don’t have the real thing you can code for it exactly how we did in the ’80s. 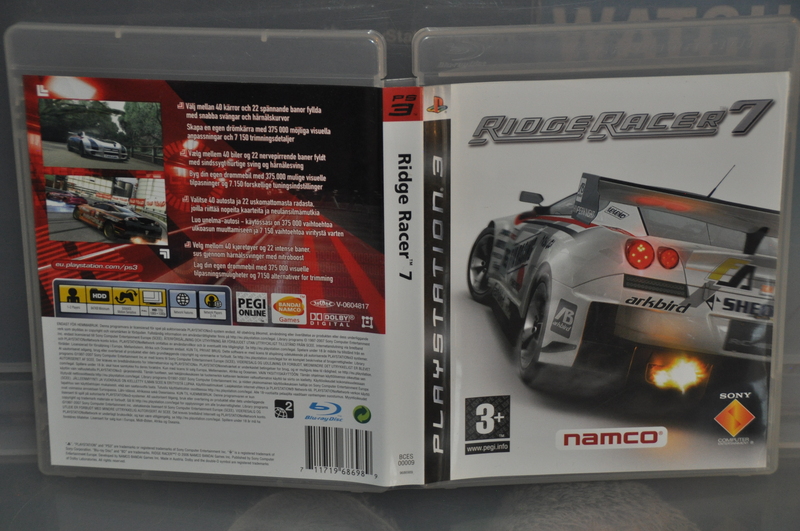 In addition, dedicated software and hardware now allow coders to develop applications for those computers on the real machine or on the emulator, and then port files from a set-up to the other in a matter of minutes. The present article deals with one of those dedicated hardware boxes that can make you cry to a miracle, finally giving you the chance to go to your basement and dig out your favorite artifact of the past. 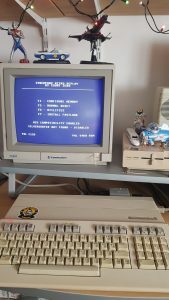 As you can see from the pictures, I am a lucky and proud possessor of a Commodore C-128 computer. This beauty, coming straight at us from 1986, is the machine where I cut my teeth as a coder while I was attending an IT school. Despite its 33 years, it still works like day one, and a few months ago I decided it was about time to have some fun again as we did in the Golden Age. In the ’80s every computer came out with a version of Microsoft Basic hard-coded in its ROMs, so getting the computer to work was not a problem: in other words, you fire it up and you are ready to go, instead of just having a blinking cursor that prompts you for additional software. Yet, no serious computing can be done without a mean to save and load your programs. My 1571 floppy disk driver (5 and 1/4 floppies, they were), is still working fine but there is no way to guarantee that it will last long since there are mechanical parts in motion that are obviously not eternal. Finding a way to save/load my old programs was, therefore, mandatory. Luckily, there are people out there that know how to fulfill a dream. So here we are, introducing the Ultimate-II+ computer cartridge. 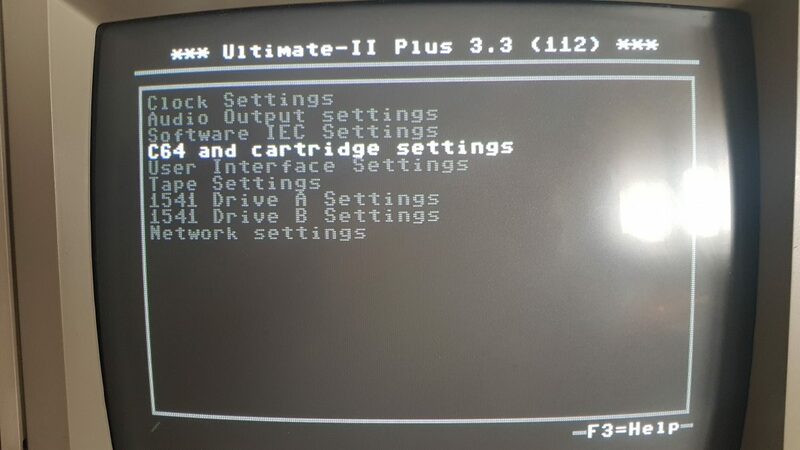 As stated on the official website the main feature of the Ultimate-II+ is a cycle accurate implementation of the Commodore 1541 Floppy Disk Drive. This part of the Ultimate-II+ cartridge thus acts exactly like a real drive. It is not any faster or any slower than a real floppy disk drive. Just like a real 1541 disk drive, the needs “floppy disks”. On the Ultimate-II+, these floppy disks are virtual. These virtual disks exist in the form of a .D64 or .G64 file on a storage device, such as the supplied USB stick. When the user selects such a file, it is linked to the emulated drive. This process is called ‘mounting’. After mounting (which will take a few seconds to complete), the 1541 can access the image file as if it was a real floppy. All standard commands that you are familiar with while using a real CBM1541 then apply. As a matter of fact, the cartridge was developed for the C-64, the best-selling 8bit home computer of all times, but works just fine on C-128 as well. Actually, the C-128 used an enhanced version of the 1541 FDD (the 1571) which was faster and could store twice as much data. Since that meant only 340KB (yes, kilobytes. Millions of times less than your smartphone!) and since the cartridge actually works connected to any USB stick (the one in the picture is 16GB), this is not a factor in any way. Let’s now see how it works. 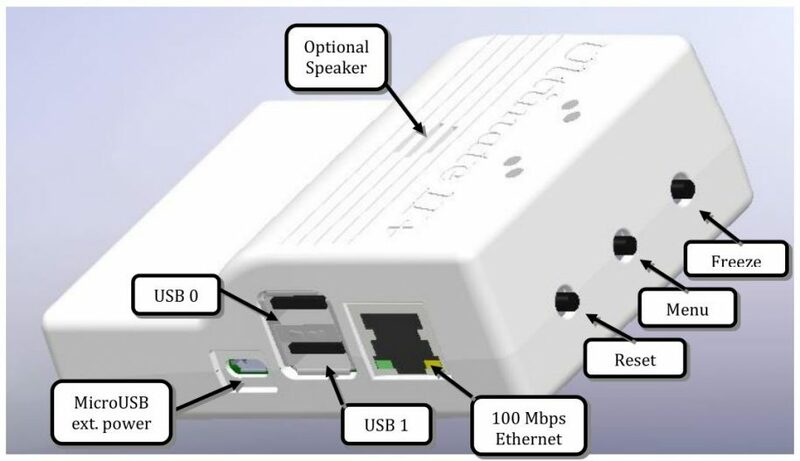 First of all, connect the cartridge to the relevant expansion bay, then connect the serial plug (provided) from the unit to your computer. 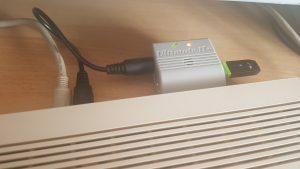 In case you want to connect it to a real drive, connect the drive first and then use the feedthrough of the drive to attach the Ultimate-II+ as the last device in the chain. 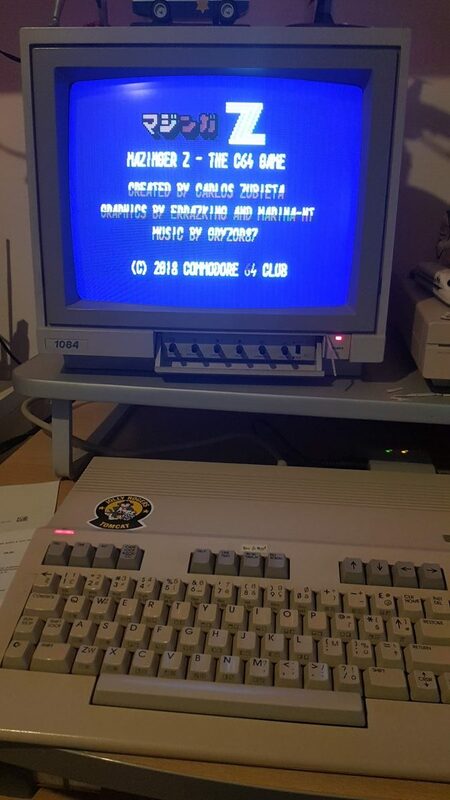 As you can see from the picture, I first plugged into the cartridge a FAT32 formatted USB stick, containing a few files in various Commodore format. Those can be: floppy disk images (.D64 or .G64 files), tape archives (.T64 files), tape images (.TAP files), Amiga MOD files, SID music (.SID files), cartridge images (.CRT) or separate programs (.PRG files). 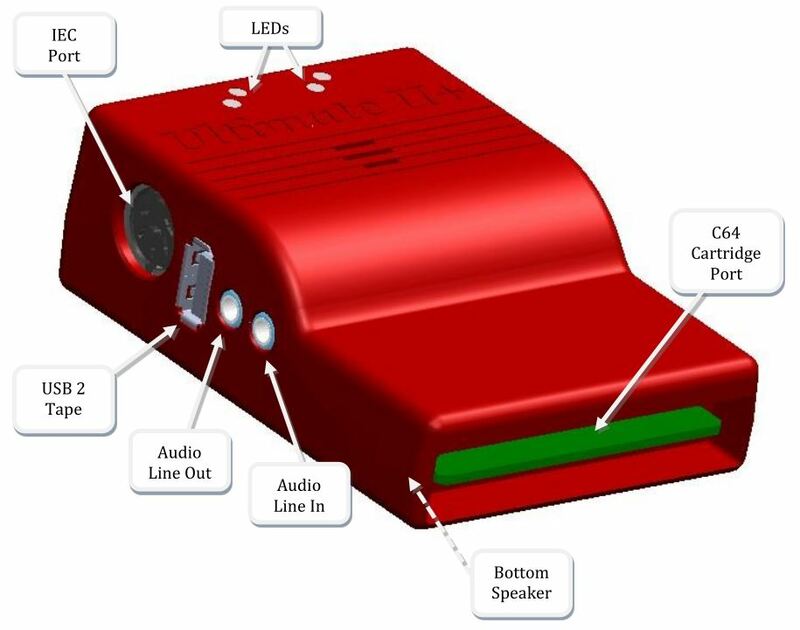 On first start, the Ultimate-II+ will load an Action-Replay type of menu. If you don’t need it for your purpose just press the menu button (center button on cartridge back), press F2 on the computer and select “Cartridge None” from the menu. The blue screen here depicted is a guaranteed buster for your hype in itself. 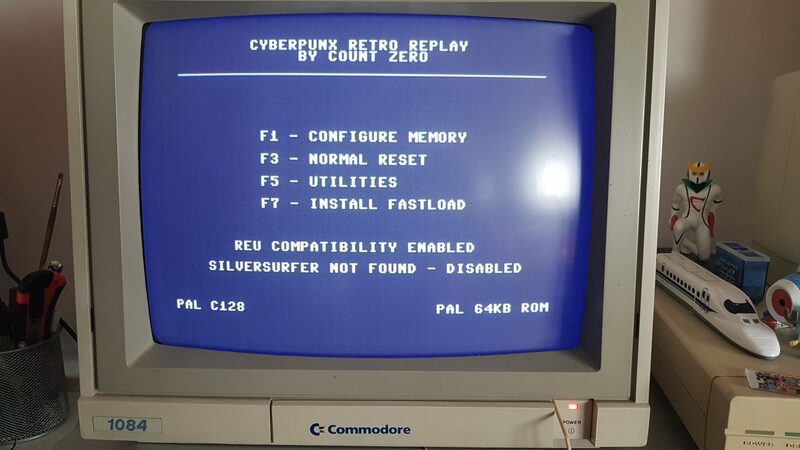 As you can read, it says “Cyberpunx Retro Replay by Count Zero”. If you are cyberpunk fan you’ll recognize in Count Zero the original title of the second William Gibson’s novel, published in 1986. Then make sure the 1541 set-ups are correct, with “8” as a device number. Basically, you are already set! 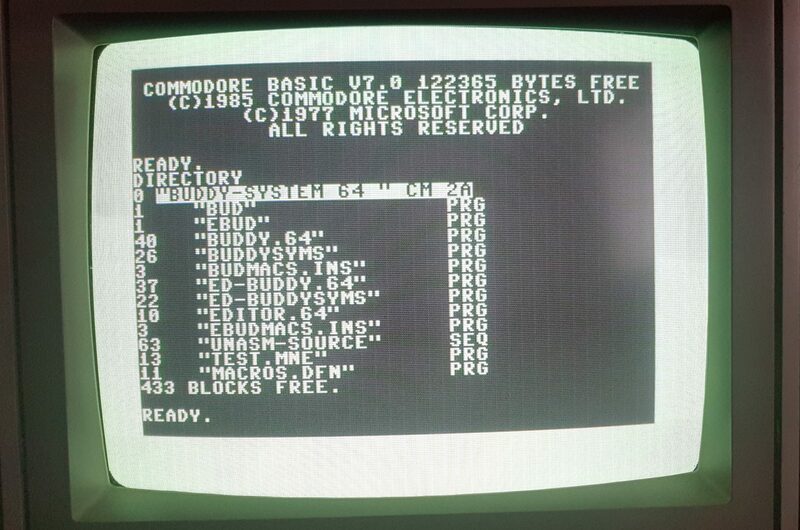 From this point on you will use your C-128/C-64 video output as cartridge and USB file browser. 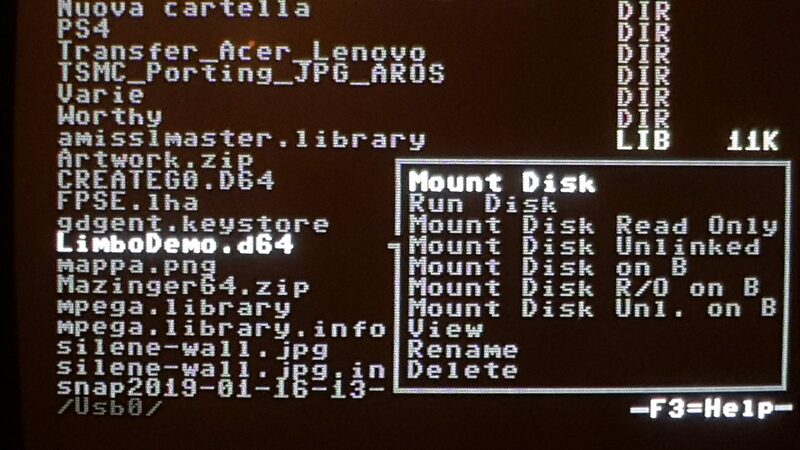 There are many different preferences you can tinker with, but if you just want to have some fun with your favorite games (or programs) just press F5, navigate the directory, select your disk image (you can either mount if first or directly launch it) and press enter. Everything is already taken care of: your software will swiftly start as intended over 30 years ago. But this is only the beginning since the Ultimate-II+ is much, much more than this. 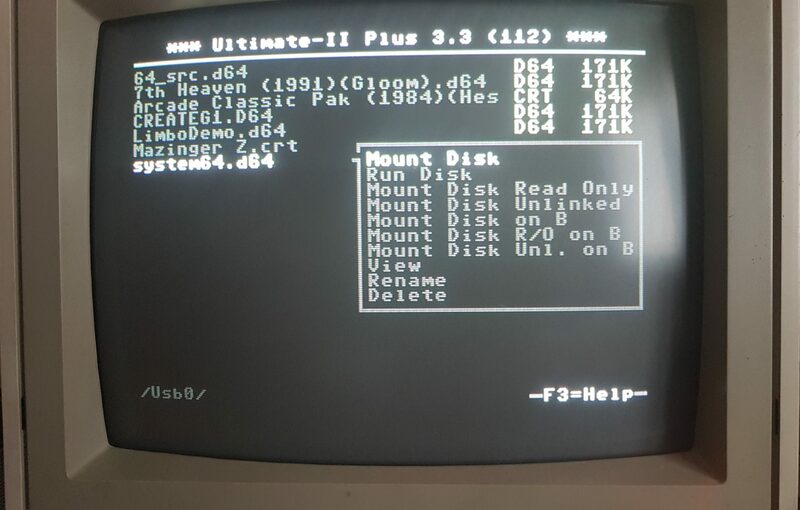 After the disk image is mounted, it will work exactly like the real thing in a totally transparent way, as you can see in the pictures below where I mounted a virtual disk and then I used it inside a full C-128 environment. You can load or create new programs and store them in the virtual disk using the same instructions you used on the C-128 (Basic V7.0) or on the C-64 (Basic 2.0). Everything saved in the virtual disk will actually be written on a relevant disk image on the USB stick, which means that when you are done you can take that stick, plug it into your C-64 Forever and/or VICE emulator and vice-versa. In addition, tape support, virtual printer support and Ethernet support are there, even though I didn’t have the time to test those features yet. In the end, this Ultimate-II+ from Gideon’s Logic really opened a new world for me or, rather, was the key-code for the Stargate that took me to the past. Yet, despite what one could think, it is not a matter of sentimentality or reminiscence of the past. 8bit computing is alive and kicking, and it is here to stay. I already reviewed a brand new project for it on these very pages and more will come in the near future. Stay tuned! 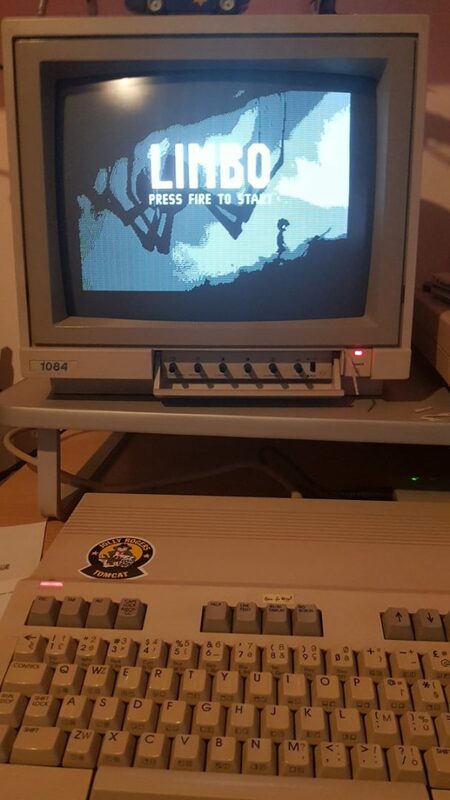 I might try to review Limbo, but what you see in the article in not the full game but the first working demo. We’ll see how things turn out.